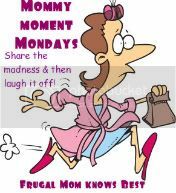 It’s Mommy Moment Monday. Mine is simple. Exhaustion! That’s it, really. I’m just plain worn out after a whirlwind long weekend that included taking a couple of days off of work last week for a wedding, visiting with lots of family and friends, playing catch up now with my day job, Macaroni Kid, and blogging. All fun stuff, but I am tired. Add to that a sick (allergies) baby, sick (allergies) husband, and sick self … yes, damn spring allergies! I guess I’ll take it easy tonight, go to bed early, get some extra rest … oh, wait, nope. Baby says nope! Feed me. Change me. Cuddle me. Well, I wouldn’t have it any other way. Exhausted or not! Sorry for the cop out today. You should check out Frugal Mom Knows Best. She has a scary story to share that reminds us all of just how important it is to trust our mom-instincts. Those babies won't ever cut a mom some slack! I hear you, sistah! I figure the exhaustion will stop once my kids sleep in past 6, but then I remember they sleep in because they start staying up later... so maybe when they are in college. I just have to stop having kids to see the end of exhaustion...which at this point is 18 years. Sigh....good luck! Mommy moment one thousand.....taking a week to get to the links!! I am with you girl! I am trying to get this mac kid thing going (my gosh, I am a fleck compared to Supah! ), lose some weight, and keep the family running. Remember when we did all that and still managed to do our nails to go out that night?